Ready to grow your own hazelnuts? Buy "3 Trees for Nuts" from the following Stockists. Australian Gourmet Hazelnuts (AGH) is a vertically integrated hazelnut enterprise propagating and supplying hazelnut trees, and processing, value adding and marketing Australian grown hazelnut kernel. AGH is based at Mudgee in Central West New South Wales. Our mission is to provide consumers with the ultimate hazelnut eating experience – every time. 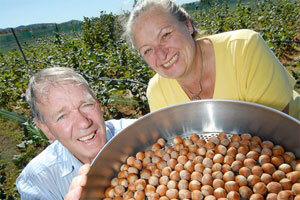 We supply premium quality freshly cracked Australian grown hazelnut kernel at peak nutritional content and flavour. Our kernel products are winning high regard for their quality and consistency, and many loyal customers. After many years of research, we chose the Australian bred hazelnut cultivar Tokolyi Brownfield Cosford (known as TBC) to be our premium main-crop variety because of its high yield and consistent performance over a wide range of Southern Australian soils and climatic conditions – and its unique outstanding flavour. 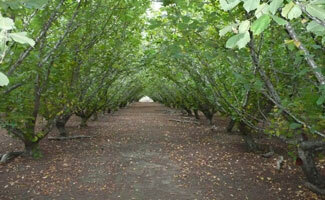 We propagate young hazelnut trees in our nursery at Mudgee. Bare rooted planting stock becomes available in winter and should have been planted before bud-burst. Gourmet n:- one who appreciates food from the point of view of what pleases the palate and benefits the health. Encyclopedia Britannica 1952. AGH Partner Grower – supported by AGH with support, services and crop buy-back. Main variety supplied TBC with compatible pollinizers. Commercial Grower – suits growers who wish to develop their own market for nut in shell or value added hazelnut product. Main crop varieties supplied:- Oregon Barcelona or TBC with compatible pollinizers. Lifestyle Grower – suits the farmer or small land owner who wishes to supplement diet or income with home grown hazelnut – whether grown as a small grove or as a hedgerow. Varieties supplied – Turkish Cosford, Oregon Barcelona with pollinizers.